The Cossack Church of the Exaltation of the Cross is in fact a complex of churches and chapels dominated by a spectacular belltower and entrance gate with beautiful curving colonnades stretching on either side. The Church of the Exaltation of the Cross stands on the site of one of St. Petersburg's oldest cemeteries and churches. Originally the parish church for the Coachmen's Settlement, the first wooden church, named after the Birth of John the Baptist, was erected here in 1719. In 1764, a second wooden church, with heating for winter services, was consecrated in the name of the Tikhvin Icon of the Mother of God. The first stone church was built on the orders of the Holy Synod in 1794, by which time the area was predominantly populated by Cossacks serving in Imperial regiments. Thus the church got its current name, and it remains a centre of the Cossack community in St. Petersburg to this day. The superb early neoclassical belltower and its two side chapels were built 1810-12, and in 1844, the Tikhvin Church was replaced with a new stone building, a simple white one-storey structure with a single pale blue dome, currently the only fully functioning church in the complex. 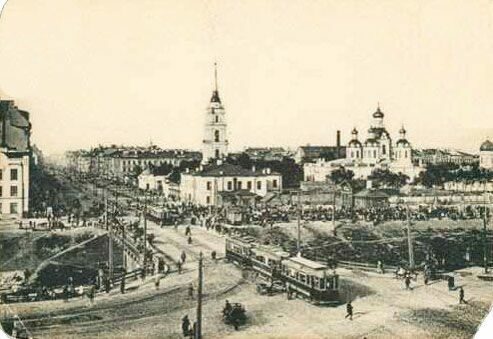 In 1848-51, the old Church of the Exaltation of the Cross was replaced by the modern cathedral. Designed by Egor Dimmert, the Cathedral took its cue from the belltower, and is a similarly elegant and symmetrical neoclassical structure. The final church in the complex, the Church of Ss. Kirill and Mefodiy, was built by church elder and merchant Ivan Shigalev in 1872 in memory of his wife. In the 1930s all of the churches in the complex were closed, and their rich decorations plundered. The cathedral was completely reconstructed inside and, ironically, turned into workshops for restoration. 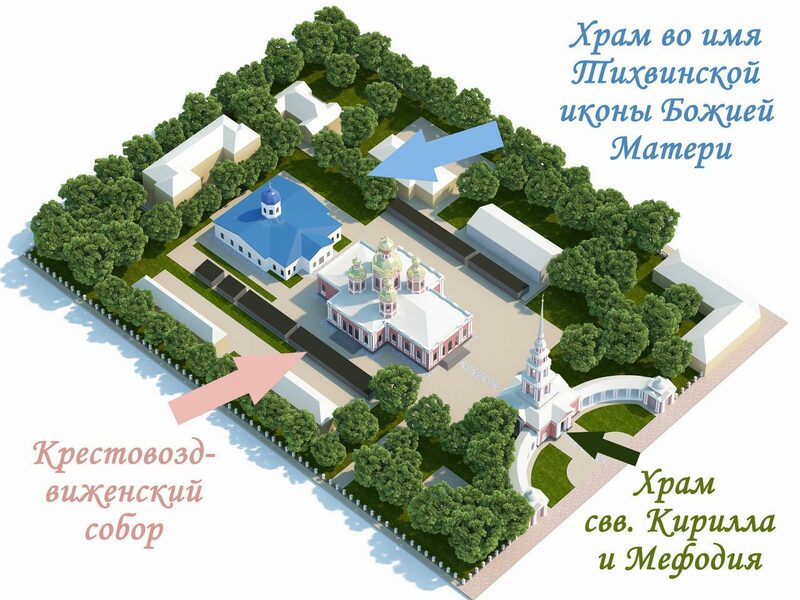 The complex was restored to the Orthodox Church and the Cossack community in 1991, and restoration work is still ongoing. Services are held in the Church in the name of the Tikhvin icon of the Mother of God, the Church is open for visits to parishioners only during worship, during the rest of the open Holy cross Cathedral and the chapel on Ligovsky Prospekt. Holy cross Cathedral is open for daily visits parishioners from 9.00 to 20.00. The time of the chapel on Ligovsky prospect from 10.00 to 19.00 (lunch from 13 to 15). Address: 191119, S.-Petersburg, Ligovsky prospect,128.